Fragrant. 4 to 5+ Feet. July flowering. Photographed in our display garden for their March 2003 issue, Sunset Magazine featured this lovely Oriental-Trumpet or "Orienpet" hybrid for its garden worthiness. 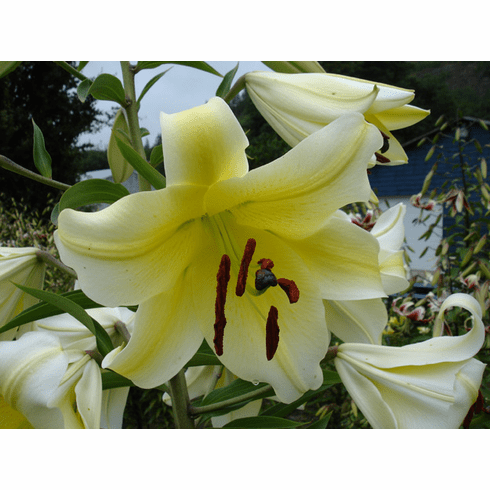 Flowers are out-to-up facing, bright, creamy-lemon with paler petal tips and have a very good substance, which means the petals are thick and last longer in the garden. Full grown Redwing Blackbirds perch on top of the buds, waiting for their turn at the feeders, and outside of a few puncture marks from toenails, these sturdy lilies are not harmed in any way. Lingering, sweet fragrance, long blooming. 4 to 5+ Feet. Late July / Early August Flowering.